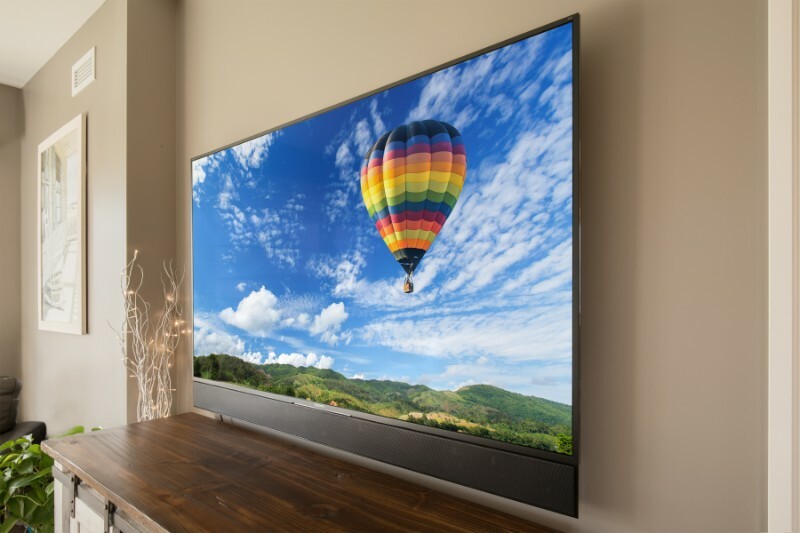 Most of us have at least one or more flat-screen TVs in our homes these days and of course we love how they look – minimal and elegant – and the picture quality is often outstanding. However, the sound quality from the built-in speakers of most flat-screen TVs are nothing special, that is for certain. Without an upgraded sound system, the intelligibility of voices, quality of music, sound of sports stadiums, and impact of special effects is definitely lacking. At Design Electronics we have a unique solution for a great audio experience for all of your flat-screens without compromising the clean, modern look that you know and love. The option that we most often recommend, which is known by the general public, is that great sounding custom-made sound-bars are available at a reasonable price! These sound-bars are made to order and they are aesthetically pleasing to the eye: the offer a clean and sharp look that match the width and cosmetic of your TV. You can make them look part of the TV as they get mounted right to the bottom or top of the TV, and look like they were built-in straight from the factory. And yes, although there are scores of sound-bars on the market, the big box stores are not going to introduce you to the higher performance, custom-made sound-bar options. There are a number of great companies that Design Electronics’ works directly with that make sound-bars match the width and finish of your TV and the products they offer boast pure quality. James Loudspeakers offers sound bars that are completely customized for your TV. Not only do they guarantee that your bar will perfectly match the size of your television, they make sure that your bar comes in the colour and format that you want. Whether you’re looking for just a centre channel, a stereo bar, or the complete package of left centre and right, they have the bar for you. Leon Speakers is another company we work with and their products offer “picture perfect sound,” as they say. They have an impressive line-up of sound-bars which include the Horizon Series Custom Sound-Bars and Media Décor-Edge Media Frame. Then there is Triad Speakers. They have a nice roster of impressive sound-bars that are awesome in design and provide rich, bold sound. Triad’s Onwall series are a perfect mounting option and they blend in well with home décor. Even better, their sound-bars are known for using high-performance drivers for great imaging, bass and output. Triad also offers the ability to customize their products in terms of mounting, finish and size. Of course you will need an audio amplifier to power your sound-bar. We have a great solution for this too. An amplifier, which is designed to mount the back of the television, allows us to connect the audio output of the flat-screen directly to the amplifier and then the output of the amplifier directly to the sound-bar. So in essence, no additional components need to be visible and wiring/installation is straightforward. When designing an entertainment system, keep in mind that sound quality makes a significant impact in your enjoyment! Our team will work with you in selecting the right sound-bars for your entertainment needs around the house. Call us today and let us help you take your sound experience up a few more notches!